Experts are calling for a substantial cull of the wild horses living in New South Wales’ Kosciuszko National Park. The government isn’t having it. The peatlands that drape the high, treeless slopes surrounding Australia’s tallest peak form a natural archive. “They are unusual bits of landscape in that they actually record their own history,” says Geoffrey Hope, an environmental historian at the Australian National University, who has been studying these unique bogs for more than 15 years. In this famously dry continent, the peatlands of Kosciuszko National Park in New South Wales are remarkable in their persistent sogginess. They experience heavy frost and snow in winter and, occasionally bushfires in summer. Yet somehow, they endure, providing a haven for one of Australia’s most critically-endangered species, the brilliant yellow and black Corroboree Frog. But recently, a new history is being stamped into these delicate ecosystems by the hooves of wild horses. Locally known as brumbies, the region’s free-roaming horses — technically feral, though colloquially called wild — are the descendants of those supposedly abandoned by English settler James Brumby when he left Australia for Tasmania in 1804. As the wild herds grew, so did their tough and hardy reputation, catching the imagination of Australian poet Andrew Barton ‘Banjo’ Paterson. Paterson’s iconic 1890 poem ‘The Man From Snowy River’ turned the region’s hard-riding and fearless horsemen into legends, spawning three films, a television series, and even a live arena spectacular. It laid the groundwork for today’s extensive mythology around the brumbies, which can border on the mystical. But as brumby numbers have risen, they have inflicted increasing damage on fragile alpine habitats. Today these two cultural icons — the native Australian peatlands and the introduced European horses — are fighting each other for survival. Scientists, environmentalists, and even animal welfare experts are now calling for a substantial cull of brumbies to stop the devastation these large animals are causing in the Kosciuszko National Park. Such a decision is highly controversial. Brumby supporters say the horses are a significant part of Australia’s history, and a unique breed famed for their hardiness. It’s a view supported by the majority of New South Wales Parliament, which has just passed legislation to recognize and protect the heritage value of ‘sustainable’ wild horse populations in the national park. In his speech to the New South Wales Legislative Assembly about the bill, Barilaro — whose electorate includes the Kosciuszko National Park — made it very clear that his intention with the legislation was to put an end to any possibility of lethal control methods, such as ground or aerial shooting. But evidence suggests that culling may be the only viable way to bring brumby numbers down to manageable levels. In 2016, the New South Wales Office of Environment and Heritage published a review of the previous wild horse management plan for Kosciuszko National Park. That plan, passed in 2008, relied on trapping the brumbies with lures, and then removing them from the park for domestication and re-homing. But the review found that only 583 of the 3,183 horses removed from the park since 2002 were actually re-homed. Due to a lack of demand, the other 2,600 horses were sent to a processing plant or slaughterhouse. The federal Bureau of Land Management in the United States has faced a similar challenge in trying to re-home captured mustangs — descendants of horses brought to North America by the Spanish. Rising numbers of these similarly feral horses threaten the desert ecosystems of the Western rangelands, but because their slaughter has effectively been prohibited, the Bureau itself currently cares for some 45,000 captured animals in pens and pastures, at a lifetime cost of around $50,000 each. Earlier this year, New South Wales Deputy Premier John Barilaro introduced legislation (which was passed in June) to ban the culling of brumbies in Kosciuszko National Park. The animal welfare implications are of considerable concern to Bidda Jones, chief science and strategy officer for the animal welfare organization RSPCA Australia. Jones calls the process “extremely traumatic.” She explains, “They’re trapped in the park, then put in a stock trailer, driven to the depot, then put on a truck and taken to another place. How many times that continues depends on where they end up.” In Australia, there are only two slaughterhouses licensed to export horse meat, both of which are more than 600 miles away from the national park. The group noted research showing that in addition to compacting soils, the brumbies created gullies through the peatlands, draining them of moisture. They also increased turbidity in streams, trampled vegetation, and created manure piles acting as ‘invasion windows’ for exotic plants. With brumby numbers now so high — estimates range anywhere from 3,000 to 14,000 — the experts concluded that culling should be included in any plan to sustainably manage them in the national park. Having considered all management options, the group — including Jones — concluded that aerial shooting of brumbies was the most humane and effective means of lethal control, particularly in the less accessible areas of the park. But the experts were instructed by Barilaro, then the local member of Parliament but not yet the deputy premier, not to recommend aerial shooting. Aerial shooting had previously been used to cull 606 wild horses in 2000 in Guy Fawkes River National Park in northeastern New South Wales. That cull sparked public outrage, with accusations that horses were left to die with horrific injuries. A later investigation found only one horse had survived two weeks with serious gunshot wounds, but by then the public had turned against culls. The state government issued a permanent ban on aerial shooting of horses in the state of New South Wales, where Kosciuszko National Park is also located. The Independent Technical Reference Group’s report informed the revised wild horse management plan for Kosciuszko National Park, released in draft form in May 2016, which set a target to reduce the wild horse population by more than 3,000 within five to 10 years. The management plan, which was put together by the NSW Office of Environment and Heritage, recommended a range of control methods, including trapping for re-homing or slaughter, fertility control, fencing … and ground-based shooting. 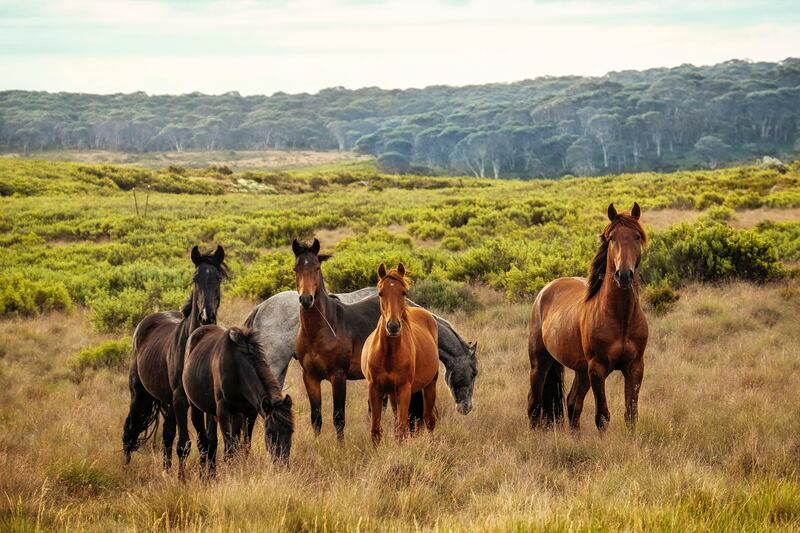 Meanwhile, Barilaro and pro-brumby groups acknowledge some brumbies need to be relocated from the more ecologically sensitive areas of Kosciuszko National Park to other areas within the park where they can be sustainably managed. They support the continued use of trapping, mustering, and rehoming to achieve this, but oppose any culling. However, there’s little detail on where those less-sensitive areas might be, and some — like ecologist Don Driscoll — argue that feral horses have no place anywhere in the national park. “One of the key points I’ve been making is how little national park-protected areas there are in New South Wales; less than 9 percent of the land is set aside for native Australian species,” says Driscoll, a terrestrial ecologist and director of the Center for Integrative Ecology at Deakin University. In addition to providing habitat for the Corroboree frog, “They’re trapped in the park, then put in a stock trailer, driven to the depot, then put on a truck and taken to another place. How many times that continues depends on where they end up.” Kosciuszko National Park also shelters other endangered species, including the Smoky Mouse, Raleigh Sedge, Mountain Pygmy Possum, Guthega Skink, and the Stock Galaxias fish. “It’s a slap in the face to everybody who’s been working hard to stop these species going extinct, to have a recognized threatening process banged right on top of your last populations,” Driscoll says. Despite the outrage over aerial shooting, it’s a strategy already employed in Kosciuszko National Park to control feral pigs. Across the state border in the Victoria’s Alpine National Park, shooting is used to manage feral deer. It’s also one way brumby numbers are controlled in the nearby Namadgi National Park, in the neighboring Australian Capital Territory. Finally kangaroos — a native animal so iconic that it features on the Australian national coat of arms — are widely killed by ground-based shooting. In fact, barely a week after his legislation to protect the brumbies passed Parliament, Barilaro announced an expansion in kangaroo culls in western New South Wales to aid drought-stricken farmers. Bianca Nogrady is a freelance science journalist and broadcaster whose work has appeared in, among other publications, Scientific American, Nature, The Guardian, and Australian Geographic.